CPS Camp No. 135, a Fish and Wildlife camp near Germfask, Michigan and operated by Selective Service, opened in May 1944 and closed in June 1945. Some men elected government-run camps after disillusion with religious based camps. The men moved dirt, controlled weeds and dug duck ponds as part of the development of the game preserve. Action was a newsletter published by the men at Camp 135 in June 1944. 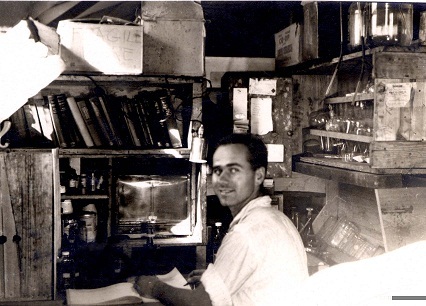 Dr. Don DeVault in his homemade laboratory, CPS Camp #135, 10/27/44. Lyrics to "Opposition to Conscription" and "Our Old and Dusty Loam"